Over the years, The Leicestershire Running and Athletics Network (LRAN) has continued to offer opportunities to those qualified as leader or coach, and also their club member runners, to learn and to improve the standard of running in the County; both for those new to the sport and for seasoned runners alike. The latest initiative in this programme was to host a “running drills workshop” and it turned out to be a real hit! 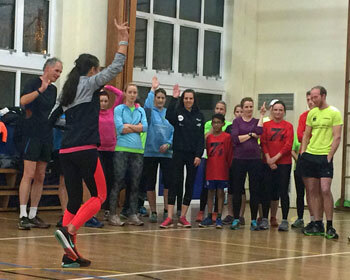 Around 50 people ,which included run leaders and coaches as well as club runners, enjoyed a really excellent workshop led by England international athlete Gemma Hillier-Moses. To many of those attending this was their first exposure to drills and many had no idea what to expect, however Gemma’s clear and enthusiastic instruction and demonstration soon had the group thinking about their running style and how they could improve it through the effective use of drills. Immediate feedback was unanimously good and there have already been many requests for follow-up workshops and these will be added to the Network winter development programme which also includes workshops on biomechanics and strength and conditioning. The “Leicester Runners” Facebook page which has well in excess of 1000 members was awash with praise following the session with Sam Middleton, who is one of the administrators for the page, posting “….AMAZING running drills session. I feel so energised and positive, more of the same please. I would do this weekly if it was available – absolutely loved it!” To reinforce what has been learnt we have posted a series of videos of Gemma performing the drills (here) and we will be working with her over the winter to increase the number of drills and videos available.